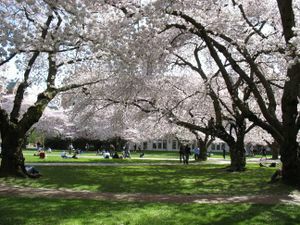 The University District, or "U-District", surrounds the University of Washington in northeast Seattle. It's centered on University Way Northeast, which all the locals call "The Ave". Surrounding neighborhoods include Ravenna to the north, Wedgwood to the northeast, and Laurelhurst to the east. Largely residential, their attractions are included here. By car, take the 45th-50th Sts. exit from I-5, or head north from the Montlake Blvd. exit on SR-520. Parking on the campus itself is very expensive, up to $15 per day, although it's free after noon on Saturdays and all day Sundays. The vast E-1 lot east of campus on Montlake Blvd. is a relative bargain at $7, but without a university ID, you'll have to pay in all quarters! Street parking is more plentiful away from the campus. Metro has cut the old express bus routes between downtown and the Ave since construction was completed on the Link Light Rail station. The transfer point at Campus Parkway and University Way still connects to numerous other services, and the campus itself has excellent and wide-ranging commuter bus service, though most of the runs to the distant suburbs do not run on weekends or holidays. Biking from Downtown is a snap. Make your way northbound towards South Lake Union and to the Westlake bike path and take it all the way to the Fremont Bridge, where you can either take the stairs at the north end of the bridge or turn right onto 34th and then make another right a few yards ahead to get onto the Burke Gilman Trail. The Burke will take you through the residential parts of Wallingford, past the extremely photogenic Gas Works Park, under the I-5 and the University Bridge and finally to UW campus. Sound Transit Link Light Rail has connected the U District to the rest of Seattle in a big way. The train picks up at Westlake Station near Pike Place Market, or at any other light rail station on the route, even Sea-Tac Airport. The UW station is located on the same lot as Husky Stadium and is directly across the street from the campus. The UW campus has a number of notable museums and buildings which are open to the public. Gargoyles Statuary , 4550 University Way N.E. A unique shopping experience for gothic or history buffs. This store is replete with atmosphere. Authentic replicas of medeival, romanesque and gothic statuary peak out at you from all corners of this shop while ambient strains of Gregorian chant or 'Dead Can Dance' play over the store's sound system. It has one of the most creative product displays in the area. You'll find a unique gift to suit almost any budget. As can be expected, there are plenty of inexpensive places to eat in the U-District. Wedgwood is home to several neighborhood gems, including the landmark Wedgwood Broiler, the Wedgwood Ale House (locally owned, with great beer and delicious, made from scratch pub food), and the Fiddlers Inn (with a cabinlike ambiance, fantastic beer on tap, and an eclectic menu of food ranging from vegetarian burritos to some great pizza). Cafe Javasti offers gourmet coffee drinks, homemade baked goods, and crepes, and Cafe Van Gogh serves espresso drinks, wine and gelato. A Pizza Mart 52nd and the Ave. One of the most popular bars with UW students. Always crowded Wed-Sun. Great Pizza. Strong Drinks. College Inn Pub, 4006 University Way NE. The classic student haunt, serving thick ales and tasty chili. Blue Moon Tavern, 712 NE 45th Street (east of I-5). "Sorry we're open" says the sign at this Seattle institution founded in 1934. It's been a favorite of beatniks, radicals, and poets; erstwhile visitors have included Dylan Thomas and Allen Ginsburg. Knarr Tavern, 5633 University Way NE. Just a year younger than the Blue Moon, with a Viking theme and a refreshing alternative to the frat-bars further to the south. Popular with neo-hippies (there's a Grateful Dead cover band night). Pool tables and an Alpine-style shuffleboard. Formerly a biker bar. Earl's on the Ave, 4333 University Way NE. Pours the strongest drink on the Ave. Mondays are $4 Long Islands. Home of old geezers and greek collegians, and has an excellent kitchen. Big Time Brewery, 4133 University Way NE. Brews a variety of its own beers and serves pizza, chili and sandwiches. Galway Arms, 5257 University Way NE. Known to locals as "The Kraken". Pirate themed, Irish punk bar. Happy hour from 4 - 7PM everyday, which includes $2.50 microbrews (including Anchor Steam), cheap, decent pub food. Three pinball machines. Punk bands occasionally play here on Friday or Saturday night. The Pub at Third Place, , 6504 20th Ave NE. Well lit bar below a coffee house and book store. The entire bar is wood paneled, with tables being cross sections of trees. All day happy hour on Sundays. On the north end of the U-dist. Ravenna Alehouse Tavern, 2258 NE 65th St. Bar on the north-end of the Ave. Pool and Darts. Generally devoid of the college students most other bars in the area attract. Hotel Deca  4507 Brooklyn Ave NE, +1 800 899-0251. Near the University of Washington. Originally opened in 1931, a stylish 158 room full service "boutique hotel" in the heart of University District. Along with its panoramic city and mountain views and comfortable rooms and suites, the hotel offers contemporary accommodations featuring art-deco motifs. 100 percent non-smoking, WiFi. University Inn . 4140 Roosevelt Way NE. +1 800 733-3855. Ideally located in the heart of Seattle’s University business district, only minutes from downtown and a few blocks from the University of Washington. This Seattle boutique hotel is pet-friendly, has a 100% smoke-free environment and includes a hearty breakfast bar. The Watertown Hotel . 4242 Roosevelt Way NE. +1 866 944-4242. Modern design, good location, moderately priced. Free internet in rooms. Exercise room with some limited equipment. Refrigerators, microwaves and coffee pots in each room. Friendly, capable staff. Free breakfast and beer-wine-snack happy hour in the evenings. Also offers free bikes, if you want to take a ride during your trip. The U-District has a somewhat dodgy reputation as a rough neighborhood. If you find yourself walking down the Ave (University Way) at late hours, there will typically be fewer people loitering on the east side of the street. The number of panhandlers and "Ave Rats", as the homeless teen population is referred to, increases as you travel northbound, particularly past NE 42nd St. Conversely you're extremely unlikely to be panhandled while on campus. Seattle is a very tame city, and the "Ave Rats" tend to be harmless. Indeed, the large student population of the neighborhood allows them to 'blend in' and escape in the neighborhood in a way they cannot anywhere else in the state: don't bother them and they won't bother you. There have been robberies and burglaries in the area east of University Way between 45th and 65th where the student housing is. While walking late at night is still generally safe, it is better to walk in groups and to avoid poorly lit streets if possible. The U-District is a college neighborhood and it is pretty typical here for young people to get belligerently drunk and out of control. If you are visibly female and have to walk at night, try avoiding "The Ave" from about 47th to 52nd because for some strange reason, women tend to be harassed more frequently on this stretch of the "The Ave" than on other parts. Recommended to head west and go down Brooklyn but even as far as Roosevelt Way and then go back to "The Ave" if you can. If you are heading north, stay on the right side of Roosevelt - better lighting. The U District is still safer than most parts of the country at night, but precautions are always a good thing. In general, don't travel down the alleys, and it's best to travel with a friend if you are not local to the area. Public internet access is hard to find on the UW campus — although it has blanket wireless coverage, a university login is required. Consider trying the thicket of coffee shops surrounding the campus or the Seattle Public Library branch on Roosevelt Way at NE 50th St. This page was last edited on 4 April 2018, at 22:03.